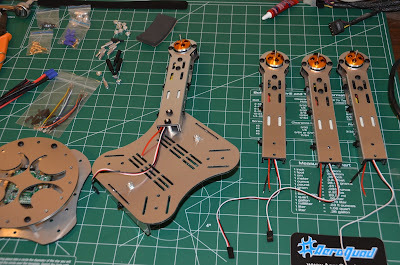 I've taken a bit of a hiatus from the mousetrap project I began a few months ago. 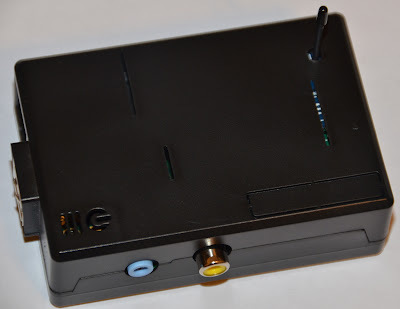 There were a couple of reasons for it, one of which was my disappointment with the range of the XBee connection, the other was short battery life of the traps. I believe I have now solved both of those problems. I've had issues with other 2.4 GHz transceivers in my home. Perhaps it is a noisy environment, or maybe it is walls lined with heavy metals. For whatever reason, my receiver would report very low RSSI readings from my mousetraps' transmitters when the transmitters were in the attic and garage and the receiver was in the office. In fact, some reports never made it to the receiver causing the logic of the software to timeout and set the mousetrap as offline. The raspi has a nasty USB issue that gives me grief every time I attempt to use the USB ports for anything more than keyboards or mice. 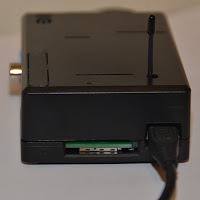 In fact, my adafruit usb to XBee adapter did not work when plugged into the raspi. I decided that if I was going to use the raspi I would need to use the built-in serial headers and enclose it inside a nice package. The plan was to place this somewhere central and I didn't want a bag of parts to be just hanging out. These items are all available at http://www.modmypi.com (no disclosure needed, just a happy customer) as well as other places around the web. The nice thing about the breakout board is that it comes with the PCB traces and headers required for the raspi to communicate with the XBee. The only thing I needed to do was solder the main header which plugs into the raspi and the smaller headers used for the XBee. 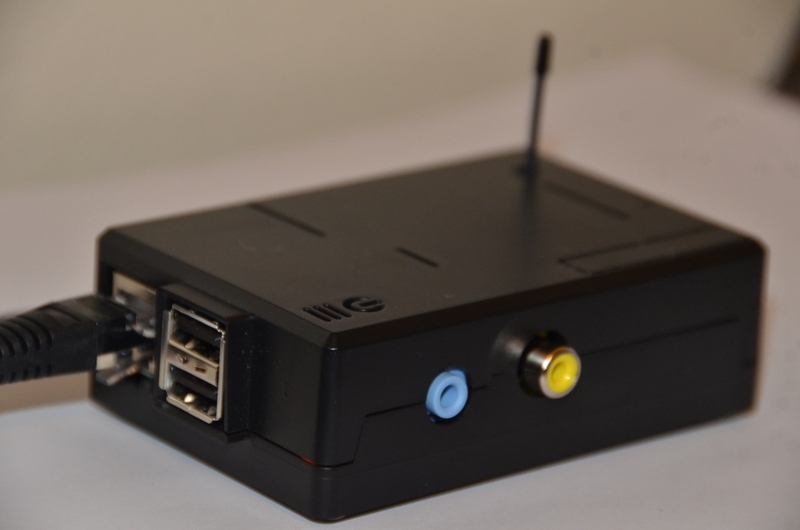 Here is the point that I want to make: The case from ModMyPi is very well done and completes the setup very nicely. However with the extra standoffs from the XBee module it will not snap together completely. I debated for about 30 minutes if I was willing to solder the XBee directly to the breakout board, but ultimately decided against it because this is still a "project" and I often hook the XBees to X-CTU for configuration. 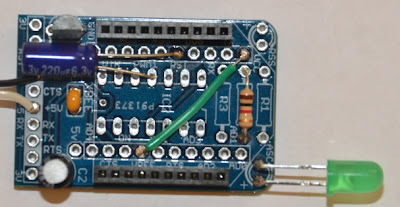 If I had soldered the XBee down, I wouldn't be able to connect it to the special breakout board which the XBees plug in to for programming. 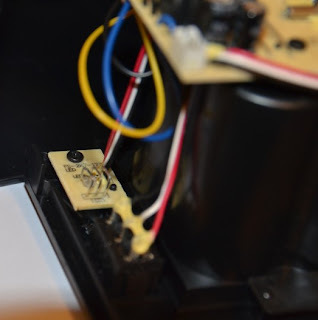 The arrow shows the hole that was drilled to allow the XBee antenna to protrude through the top of the case. The ground out area is where I used a Dremel tool to carve out enough material for the case to snap together. It isn't very pretty on the underside, but you'd never know it looking from the top! 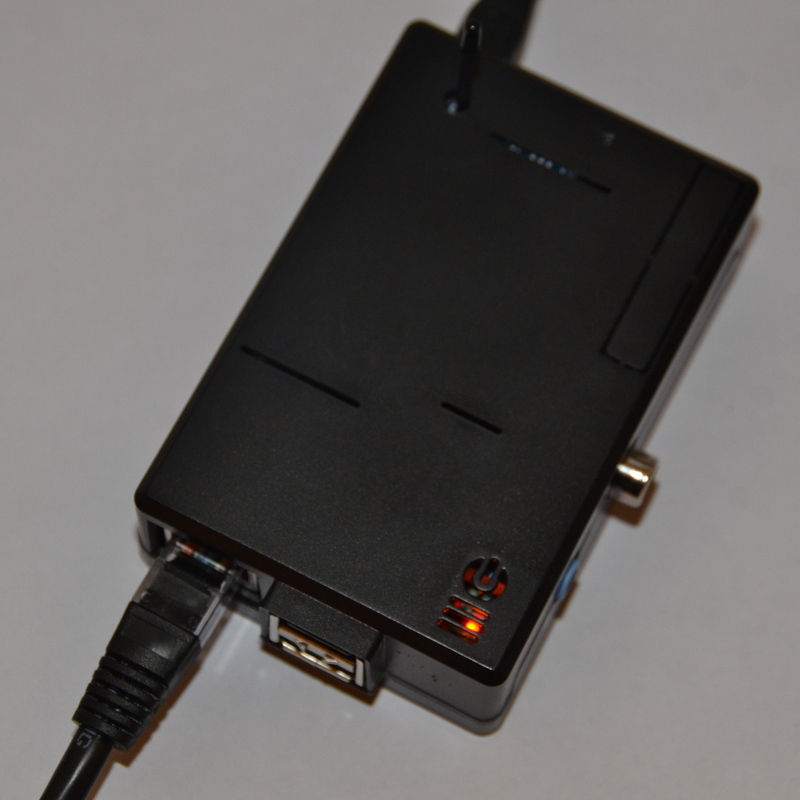 It would be nice if ModMyPi offered an extended case where the top was taller, then I would not have had this issue. It turns out that XBees use a bit of power! Even using them to wake at intervals uses more power than I expected. I've revamped the settings to poll the Victor traps less frequently, which gives much longer battery life (still testing this). 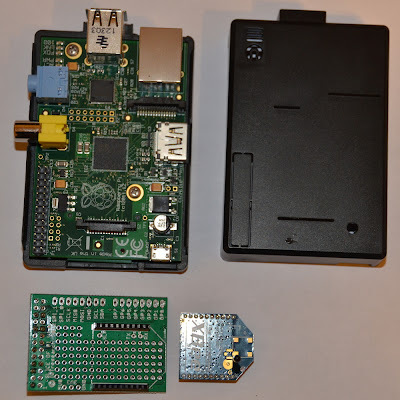 In the next entry, I will discuss and post the final python code, XBee settings, and raspi options needed to be able to use the built in serial headers in user code. 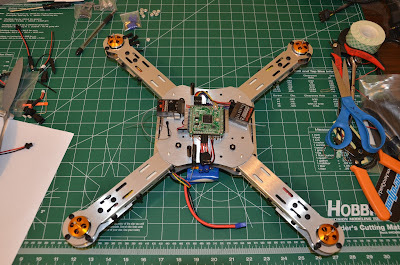 One of my latest areas of interest are multi-rotor flying vehicles. I've been interested in them for awhile, but never enough to get serious. Then last year I saw a video of a quadcopter on some website showing someone FPV (First Person View) flying around in Paris. It renewed my interested once again. This time, however, I was determined to get into the hobby. My philosophy on hardware and software is to look for something that isn't closed. This means that I don't want to spend my money or time on a platform that is controlled by a single entity with no way to improve the platform should that single entity decides to quit. I used my best Google Foo and stumbled upon AeroQuad (http://aeroquad.com). 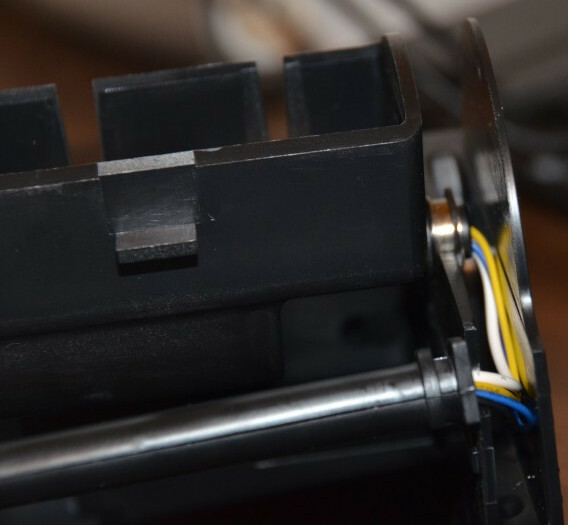 This is a project that was started by an individual but has quite a following of folks working on various parts of the platform as part of their hobby. The software and hardware are both opensource! I decided to go with the Typhoon ARF (almost ready to fly) kit because I'm new to this hobby and I didn't feel like sourcing everything myself. 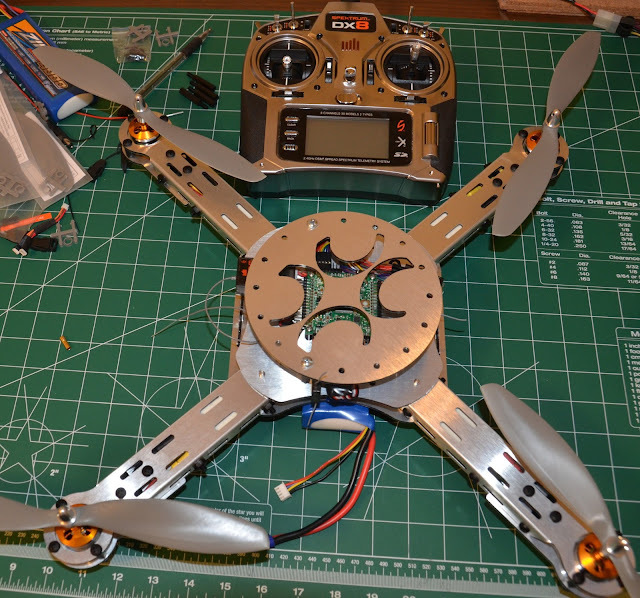 The ARF kit includes everything you need except for transmitter and batteries, so it doesn't take long to get ready to fly. Although this hobby can be a bit pricey, it was a fun and easy build. Stay tuned for flying pictures! 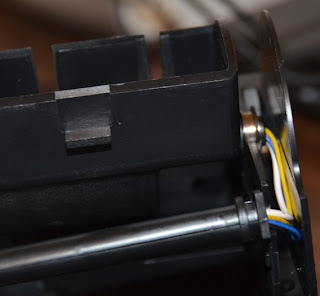 I thought I take a break out of posting about my mousetrap mod and post a bit about the HexBright flashlight. This flashlight started as a Kickstarter project, which is now something you can buy. I first bought one just to play around with it. After I got one, I was so impressed with the build quality, brightness and lens that I bought 2 more! To get yours visit http://www.hexbright.com (I was informed the price will be going up soon once it hits distributors). What makes this flashlight so special to me personally is that it is open source hardware. If you know me, you'll know that I'm an OSS/H junky. The MCU that the flashlight uses is Arduino compatible. This means that you can modify the firmware in the Arduino IDE with standard Arduino libraries and upload it to the flashlight like you would do with any of your Arduino projects. How cool is that? I've made some changes to the stock firmware and published them on https://github.com/jaebird/HexBrightFLEX/. There are several of us fairly active on github "improving" the stock firmware with things that we really want. I added SOS mode and a quick power off method where long-pressing the button in any mode turns off the flashlight so you don't have to cycle through each one. However, you can do whatever you want with it. Dare I say this unit seems as good as any of those "tactical" flashlights you might be using. The bezel of the HexBright FLEX is 1 1/4" in diameter. The Olight M20 Red Filter is 1 7/16", so the filter is just a tad too big to stay on the flashlight. So I took out my hot glue gun and laid a bead of glue on the inside of the filter to make the diameter smaller. Now the filter stays on really well with very little light bleeding out the back of the filter. Tip: Use a moistened finger to spread the hot glue along the entire inside circumference. I have some EagleTac 3100mAh 3.7 18650 Li-ion batteries that I picked up from (http://goinggear.com/eagletac-protected-18650-3100-mah-rechargeable-3-7v-li-ion-battery.html). They are IC protected with over charge protection from 4.2-4.25V and over discharge protection from 2.7-2.9V and short protection between 4A-6A. They charge and work fine with the HexBright FLEX. I have not had time to test them for how much longer the flashlight will run with this battery. 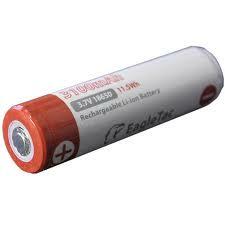 EagleTac also has a 3400 mAh battery available. Note: I have no relationship to HexBright, just a very satisfied customer... and hacker! As I stated in the first post, the Multi-Kill traps are great when you have lots of mice to deal with. The only issue is that after awhile I stop checking them as diligently and this becomes a rather smelly problem. Enter XBee! 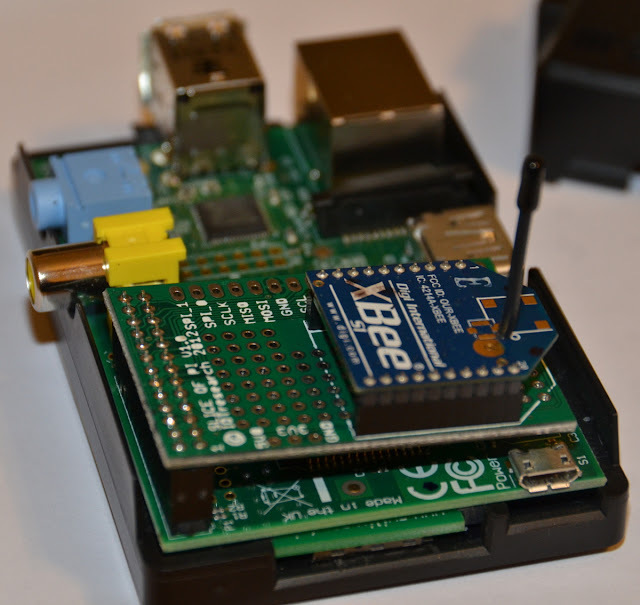 XBee's are neat little wireless modules that handle the dirty work of signaling. I use the Series 1 XBee with the wire antenna. 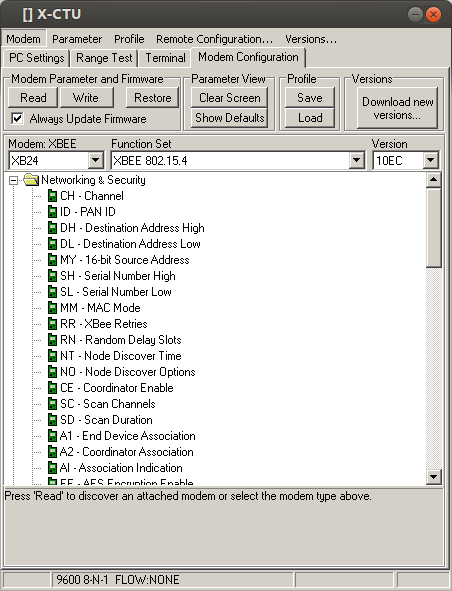 It is very easy to setup, which allows the remote XBee to cyclically send data to the receiver base XBee. I use Linux (namely Ubuntu) for pretty much everything these days. 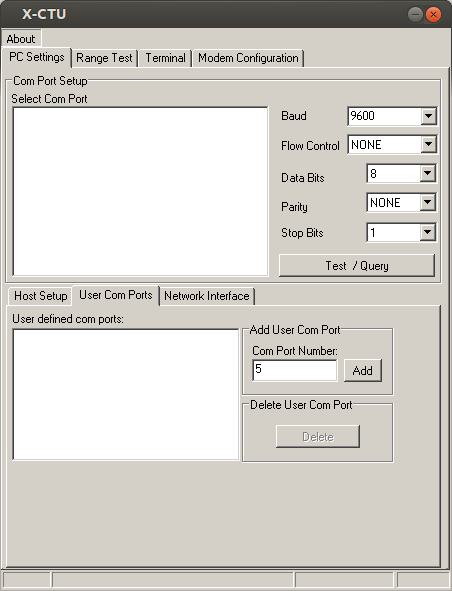 Unfortunately the XBee X-CTU application is Windows only. However, it is known to work with Wine and in my experience it works very good. 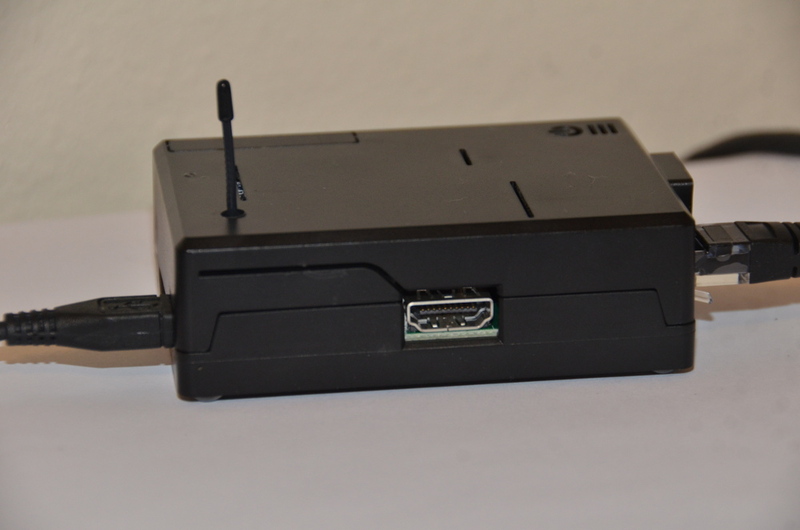 (Here is a guide for setting up the X-CTU in Ubuntu). This post will focus on the hardware modification to integrate the remote (transmitting) XBee into the mousetrap. 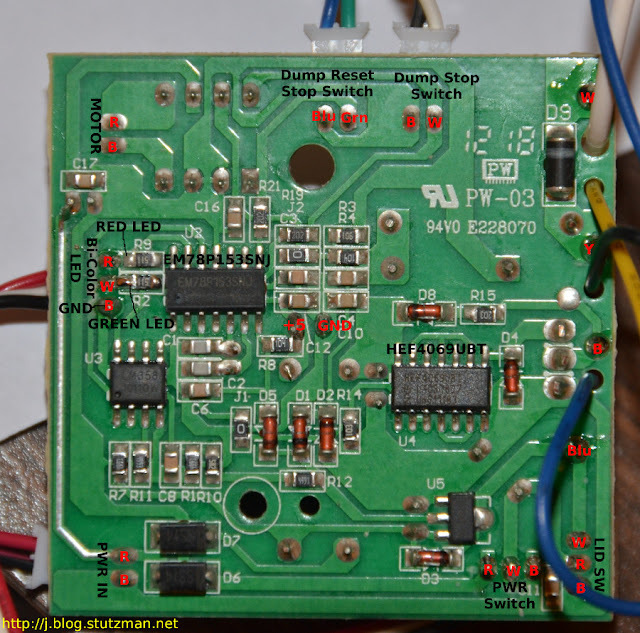 I determined that the best place to acquire the +5 and GND where on the back side of the controller board. 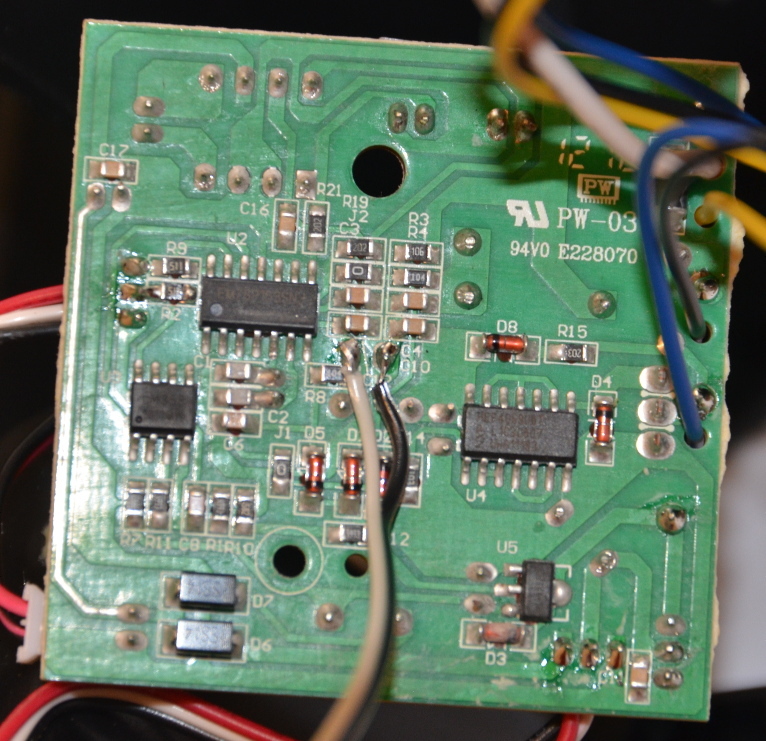 I used +5V because the adafruit module I 'm using has a built-in 3.3V regulator. 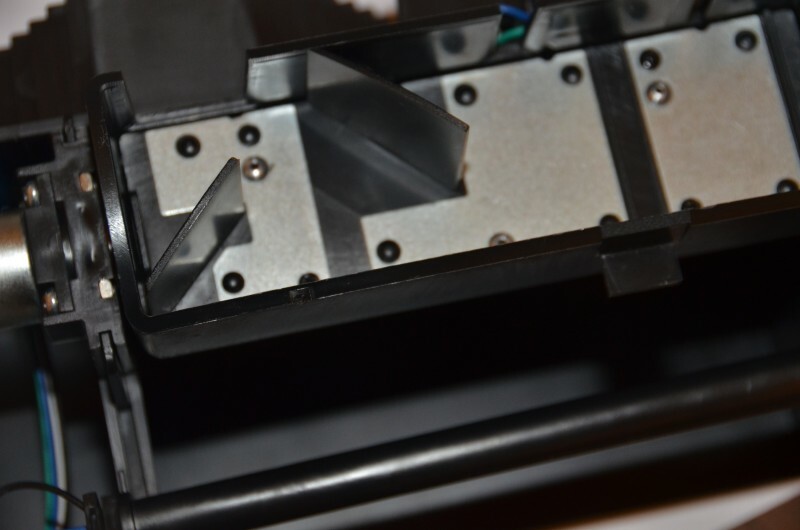 Here are a few pictures showing the install. 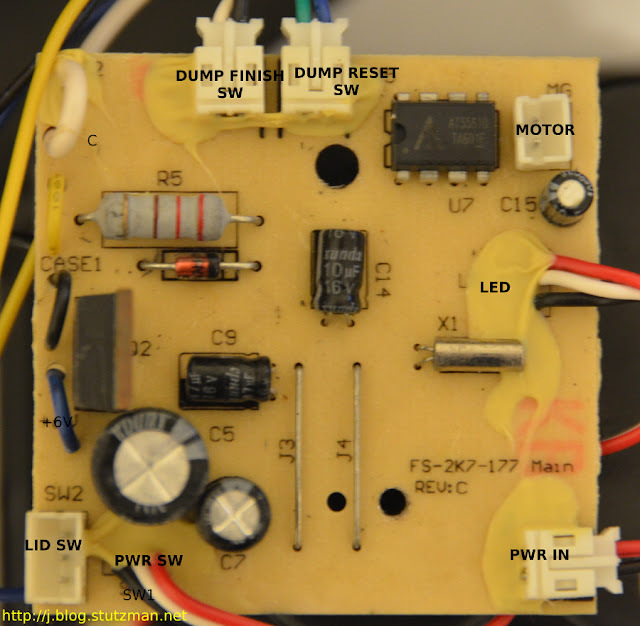 The tweet-a-watt uses a few more components. 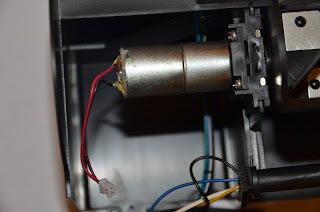 I removed the large capacitor. Using a bit of shrink tubing solder the yellow wire to AD0 and the orange wire to AD4 of the XBee carrier board shown above. Once connected, solder the I soldered the wires as shown below. Note: You will have to logout and login for the changes to be fully realized. Note: I used both uppercase and lowercase "COM" because it seemed that the lowercase worked when I was troubleshooting. Open X-CTU installer with wine program loader by right-clicking on the file in Nautilus and choosing: Open with Wine program loader. 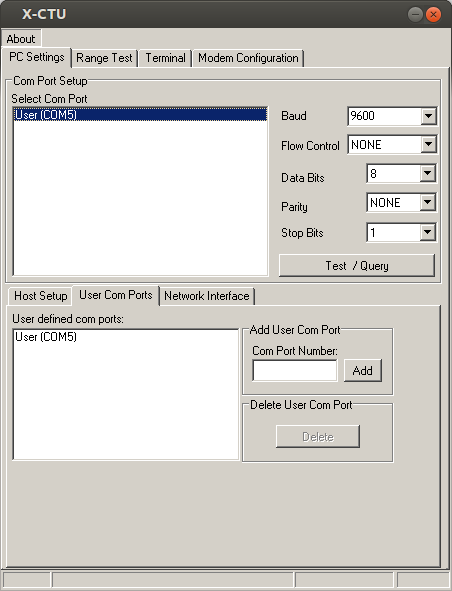 Install application. One of the things that doesn't work in X-CTU under Wine is the auto firmware download from the web. However, when you download the files manually and extract them to the correct location, you can update the XBee just like under Windows. 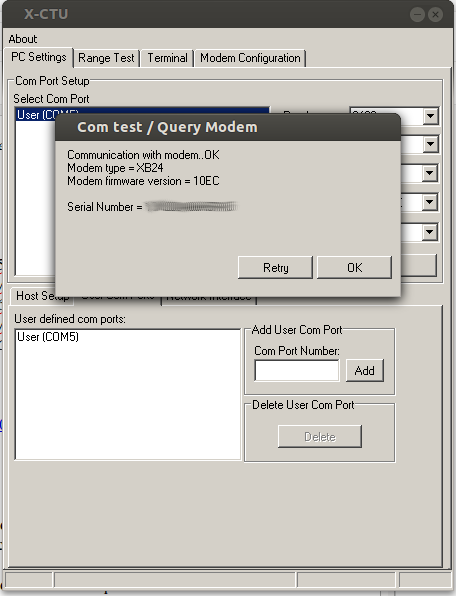 Now from within X-CTU, add the updates using the Modem Configuration tab and clicking on "Download new versions..." button. Then click on the "File..." button and choose the zip file under the update directory. Restart X-CTU and the new firmware should be available. 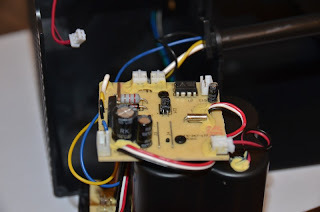 After removing the controller board from the back of the battery compartment, I began documenting wires and board traces to determine what made the trap tick. This particular mousetrap was purchased in Dec, 2012. 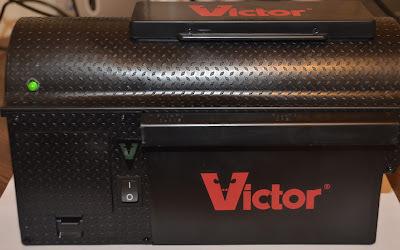 I also have one that was purchased awhile back that operates the same as this one, however, I haven't taken it apart to see if the components are different. Keep in mind, if you do this mod at a later date, things may have changed. 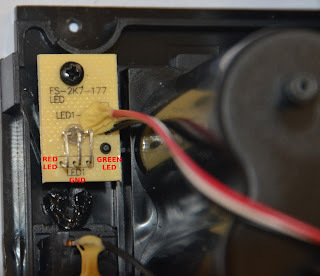 When the power switch is turned on the green LED momentarily turns on for about 1 second. When a mouse enters the chamber, the chamber will begin discharging as follows: 20 seconds of electrical current, 5 seconds of rest, another 20 seconds of electrical current, then finally the chamber will dump and the trap resets for the next mouse. Once the trap has dispatched a mouse, the green LED will blink notifying the user that there is a reason to empty the drawer. 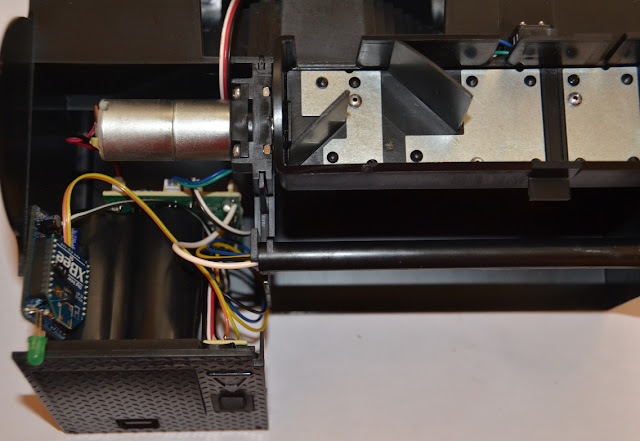 After the trap has gone through 10 iterations, both the green and red LEDs blink in unison showing an amber color to the user indicating the drawer is full and the trap will be inoperative until it is reset. 2. 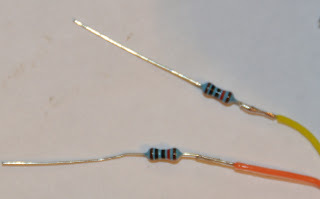 The type of Bi-color LEDs used here is the type consists of two dies with separate leads for both dies and another lead for common cathode, so that they can be controlled independently. 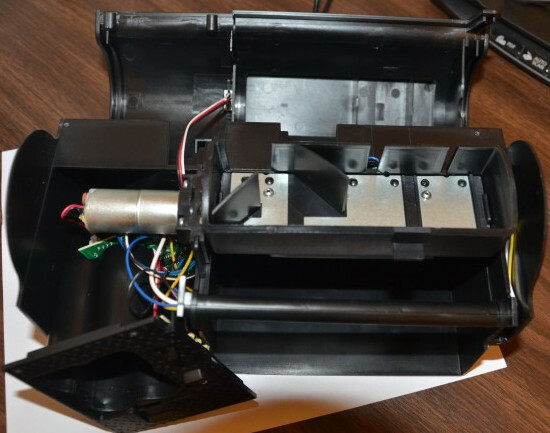 The mouse trap is very easy to disassemble. There are four screws on the front around the battery door, one screw on the front right holding the top down, and then two screws at the back along the top of the top cover. 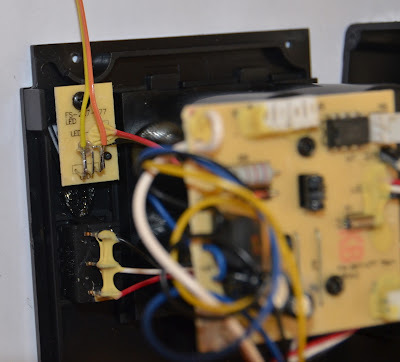 In order to pull the battery compartment out of the trap, the lid switch lead needs to be unplugged from the back of the circuit board. NOTE: Victor did an excellent job making this repairable. 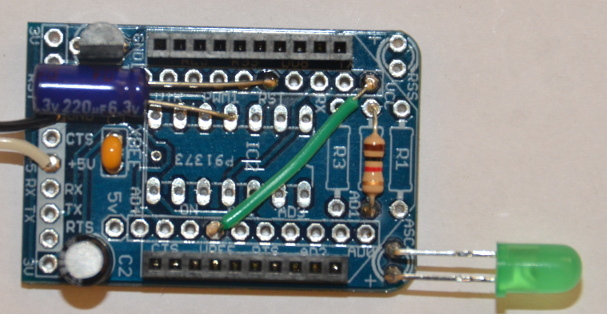 Each major component is connected to the board with a plug and socket NOT soldered to board. Kudos. Chamber the mouse goes through starting at the back left. 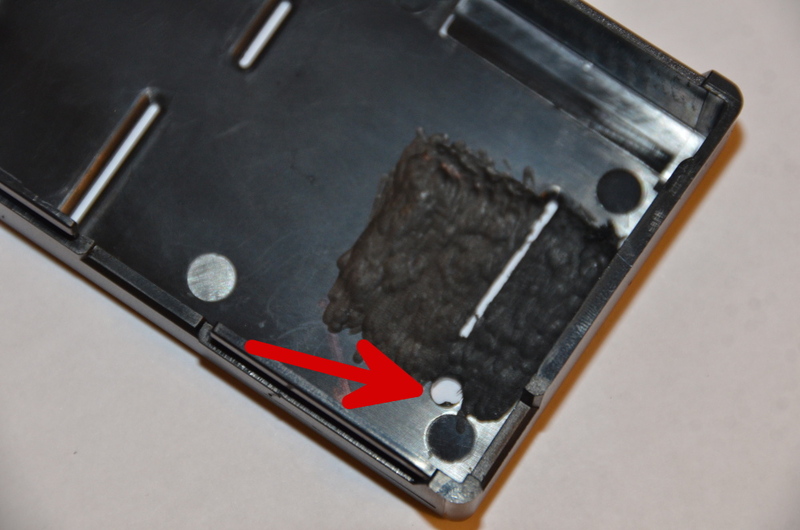 The circuit board is screwed to the back of the battery compartment. The lower left shows a small PCB where the bi-color red/green LED is located. Several wires enter the bottom of the chamber. I did not investigate them, although one is for high voltage capacitor charging! Next up, identifying the main components of the circuit board and the design for getting this information to an email.